Issue 26 of the renown journal Le Visage Vert appeared a few months ago. I've finally had the chance to explore the contents, and can give some highlights here. Of the translations from the English, there are John Buchan's "Fullcircle" (Blackwood's Magazine, January 1920; and The Atlantic Monthly, also January 1920; collected in Buchan's The Runagates Club, 1928); Jerome K. Jerome "Le Valseur" (The Idler, March 1893, as a part of a serialization of "Novel Notes"; collected in Jerome's Novel Notes, 1893, and reprinted under the title "The Dancing Partner" in Dorothy L. Sayers's The Omnibus of Crime, 1928, and other places); and H.V. Chao's "La Guérison" ("The Recovery" from Strange Tales Volume IV, 2014, edited by Rosalie Parker; H.V. Chao is the pseudonym of translator Edward Gauvin). 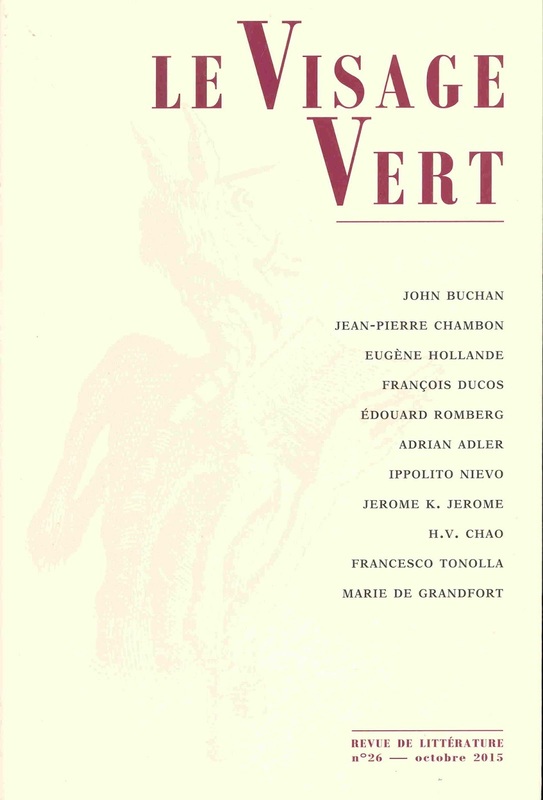 A new tale also comes from Jean-Pierre Chambon ("Une collection particulière"). Reprints of older materials include four items by Eugène Hollande (1866-1931), including "Le Sommeil de Dieu," "À l’aube," "Illusions," and "La Promesse de William"; one by Édouard Romberg (1817-1899), "Le Dernier Païen"; and one by Marie de Grandfort (1829-1904), "Une étrange aventure." "Spiritisme" is a translation from the Italian of Francesco Tonolla (1860-1916); also translated from the Italian is "Les Homuncules mécaniques" by Ippolito Nievo (1831-1861), with an introduction by Adrian Adler. Finally, in addition to the usual welcome editorial contributions, there is a long piece by François Ducos "Le Détective des Ténèbres de Fascinax à Edward Brooker"